Destruction of artifacts in Nimrud, Hatra may be 'war crimes,' it alleges. sites in Iraq and Syria, saying they may amount to war crimes. 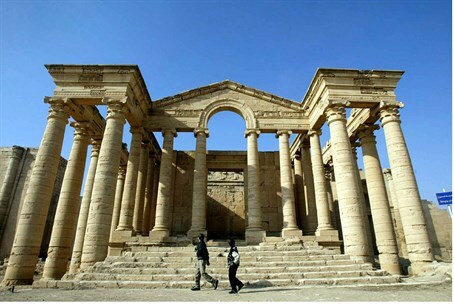 Meeting in Bonn, Germany, UNESCO delegates said the ISIS attacks on sites such as Iraq's ancient city of Hatra recalled the "mindless destruction" by other Islamist extremists in Bamiyan, Afghanistan, in Mali's Timbuktu and elsewhere. The UN Educational, Scientific and Cultural Organization (UNESCO) said "intentional attacks against buildings dedicated to religion, education, art, science or charitable purposes and historic monuments may amount to war crimes." In April, the ISIS group released a video in which terrorists can be seen using rifles and sledgehammers to destroy artifacts at Hatra. Earlier the terrorists also damaged the site of Iraq's ancient Assyrian city of Nimrud and destroyed dozens of pieces from the museum in Mosul. The UN body also expressed its "deep concern" that ISIS terrorists could destroy the World Heritage site of Palmyra in Syria, which they captured in May and have extensively mined. UNESCO said that World Heritage sites in conflict-torn Afghanistan, Iraq, Libya, Mali, Syria and Yemen also faced heightened threats through "illegal excavations, organized looting and trafficking of cultural objects". UNESCO stressed it denounces the destruction and looting of cultural objects "used as a tactic of war and as a source to fund terrorism", calling for steps against the illegal trade of antiquities and heritage objects from conflict areas. UNESCO is meeting in Bonn for its 39th committee session until July 8 and will consider at least 36 natural and cultural sites vying to get World Heritage status.